This isn't a difficult problem, but I believe I solved it without thinking why it worked. A few minutes thinking about it afterwards has, I hope, cemented the reasons behind it, which are not just the threat of checkmate from White, but equally avoiding the checks from Black. 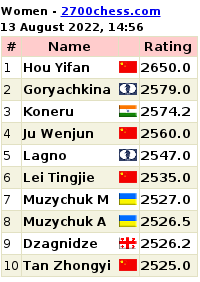 At the end of this post, is the last position from Chess Tactics for Beginners (CTB ). Time-wise, and reflecting my lack of obsession regarding a speedy completion of these, I have probably taken a comfortable 9 to 12 months ( in elapsed time ) to do this, with a boost last Thursday for the last 32 examples , some of which I repeated again this morning, since a midnight finish is not the most sensible. 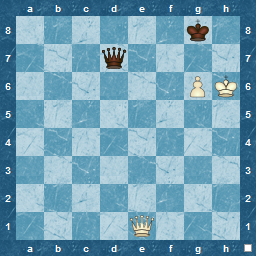 The final position was straightforward, and not involving any technical things such as "opposition", "queening squares" or "shoulder-charging" or the like, just a simple calculation. I don't think my particular version of CTB exists with Convecta/ChessOK any more, as they have been ' peshka-ising' their old CD products for some time now. I suspect that the nearest is now this, which is a 3-part product having approximately the same number of examples to solve ( 2500 ). 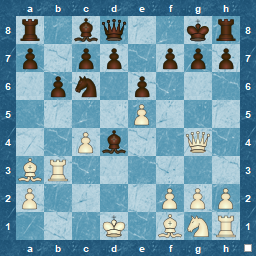 CTB was one of the products that was used previously in the chess blogosphere to try to emulate the 'de la maza' tactics splurge ( see here for one example ). 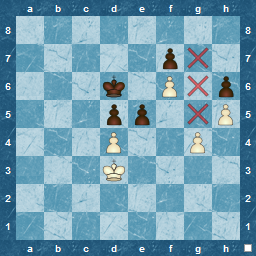 The theme in this type of endgame is the pawn structure, or maybe more accurately the squares they can control from the rook file. Once you see this, and play a few examples, it becomes very obvious, but I am sure that being presented with this in a game , especially with limited time, it could seem like a difficult place to be. However, the idea of the power of the doubled pawns , in conjunction with other blocks, is a useful tool to have and use. Hey, don't be turned off my the post subject, chess has little enough media coverage as it is, so any blip on the radar is good ! The format in this series is a continuation of previous ones , where someone is interviewed over a game of chess about both chess, and their own 'sphere of knowledge/interest/fame', with GM Daniel King giving a rather banal commentary. This time around there is a distinct chess presence as Garry Kasparov is one of those interviewed, but the series starts with Steve Davis. Who's he ? asks a large number of readers ? If you are a snooker fan you will know the name instantly, as he was World Champion in the 1980s, dominating the game for a number of years. His final in 1985 had an amazing 18 million viewers for the last game of the match ( a so-called 'black ball' game as the entire final eventually rested on the last ball of the the last frame). Davis lost it to Dennis Taylor, but sealed his place in sporting history. Chess-wise, he was also a dedicated amateur ( best in his school, apparently ) , although by his own admission not a great player. He co-authored a couple of chess books in the 1980s with English GM David Norwood, both firmly aimed at the amateur.